In 2008, CARA released results from a survey that measured a variety of different beliefs and practices among U.S. adult Catholics. Now, eight years later CARA has replicated some of these questions in a new project about religion and science. This post details the demographic, Catholic background, and religious practice changes we can identify during this period (...more on religion and science in the near future). 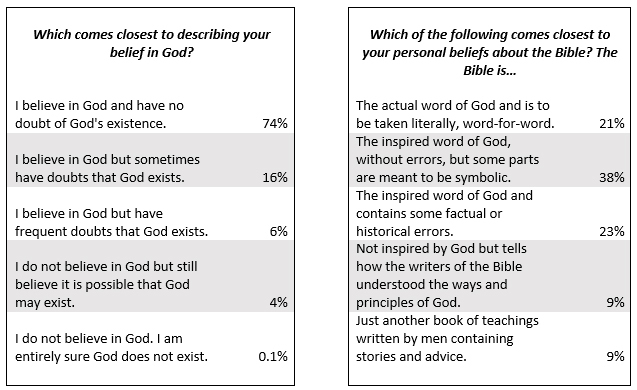 We also include results for a few new belief related questions that weren’t asked in 2008. The new survey includes interviews with 1,010 randomly selected U.S. adults who self-identified their religion as Catholic (margin of sampling error of ±3.1 percentage points). The poll was conducted May 16 to 26, 2016 and was made possible by a grant from the John Templeton Foundation. We have called attention to declines in the numbers of infant baptisms in the United States in the past. However, as shown in the figure below, we have also noticed an increase in children and teens being baptized after their first birthday. We see this in the Church’s sacramental numbers as well in the responses from the survey. Why this is occurring is still an open question. Twenty-three percent of Millennial Generation Catholics (born 1982 or later) were baptized as children or teens. 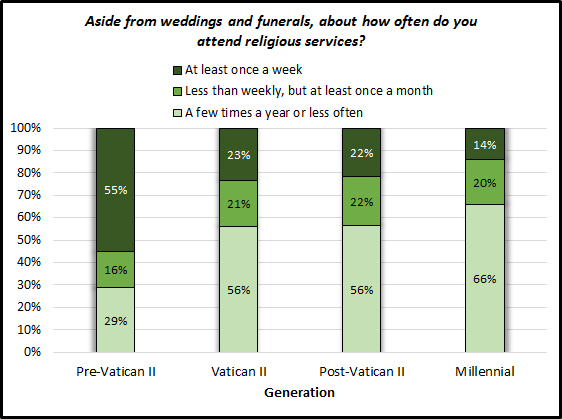 By comparison, only 13% of Pre-Vatican II Generation (born before 1943) Catholics report this. Most Catholics entered the Church as infants and fewer than one in ten entered as adults. 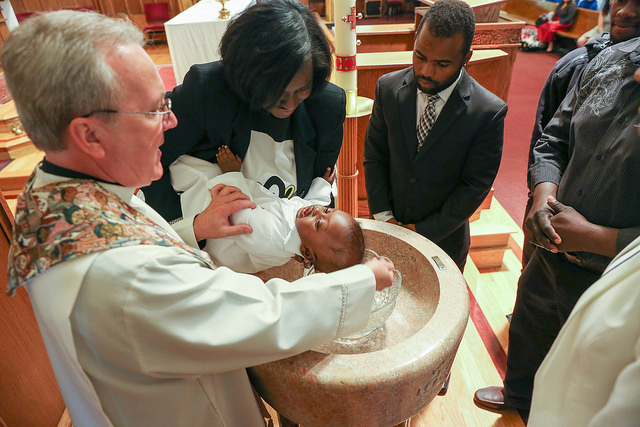 In the total population, the percentage of Catholics who are baptized that go on to receive the Sacrament of Confirmation has remained steady with more than eight in ten adult Catholics reporting this. However, underneath this aggregate percentage there is change. 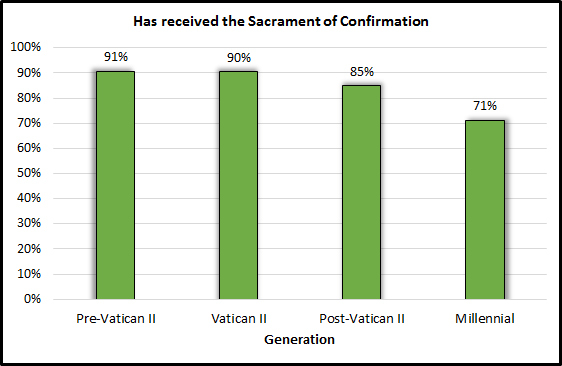 Millennial Generation Catholics are less likely than older Catholics to have received Confirmation. There has been no change in frequency of Mass attendance between 2008 and 2016. 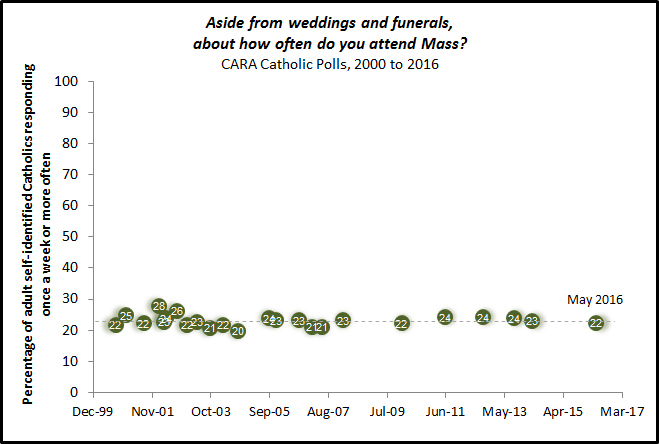 In fact, in all of CARA’s national polling since 2000, Mass attendance has only changed beyond margin of error on one occasion—shortly after Sept. 11, 2001. There was briefly a slight increase in weekly attendance in the months that followed. At the same time, it is still the case that a majority of self-identified Catholics are not “parish-affiliated” and instead either attends Mass on Ash Wednesday, Easter, and/or Christmas or even less often. Among Millennials, two-thirds are infrequent Mass attenders and only 14% attends weekly. In 2008, CARA asked respondents about praying the rosary but did not ask about prayer generally. 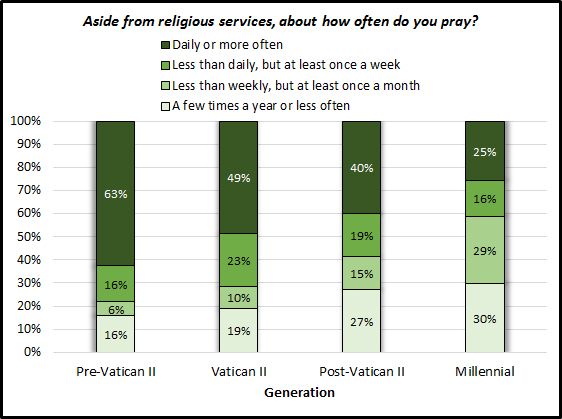 In the 2016 survey respondents were asked, “Aside from religious services, about how often do you pray?” Overall, 40% of adult Catholics say they pray at least once a day. Nineteen percent pray at least once a week and 17% at least once a month. What may be startling to some are the differences that emerge by generation. Among Millennials, more pray only a few times a year or less often (30%) than pray at least once a day (25%). Across generations declining frequency in prayer is nearly a linear trend. When coupled with frequency of Mass attendance, it appears Millennials are only infrequently involved in a conversation with God. These new data are a departure from previous trends. Overall, 96% of self-identified Catholics believe in God. This includes 74% who believe without doubts and 22% who believe but have some doubts from time to time. Four percent do not believe in God but are open to the possibility of God’s existence (i.e., agnostic) and 0.1% say they do not believe in God and are sure of this (i.e., atheist). Sixty-one percent of self-identified Catholics believe the Bible is the “inspired word of God” and 21 percent believe it is actually the word of God and is “to be taken literally, word-for-word.” Eighteen percent do not believe the Bible is the actual or inspired word of God. 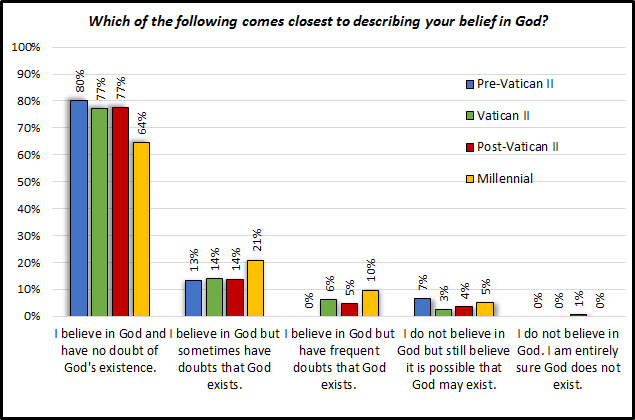 Across generations there is one notable outlier—Millennials are more likely than older Catholics to have doubts that God exists. Fewer than two-thirds say they believe in God without doubt (64%). There are few if any differences across generations in their perceptions of the Bible with older and younger Catholics responding similarly. One of the major findings of Sacraments Today back in 2008 was the zeal that many Millennials reported about this period of the liturgical calendar. They were generally more likely to report activity than older Catholics. Overall, there is little change in 2016 for all Catholics. Respondents are slightly less likely to make extra efforts to give money to the needy or to try to improve their personal habits or behavior. 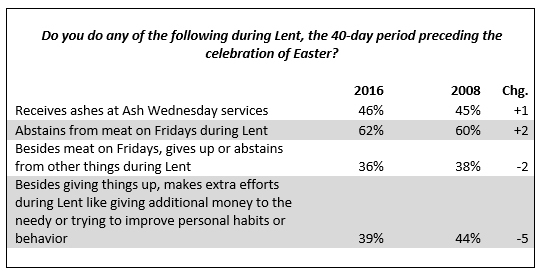 However, there are changes in the observance of Lent among Millennials. 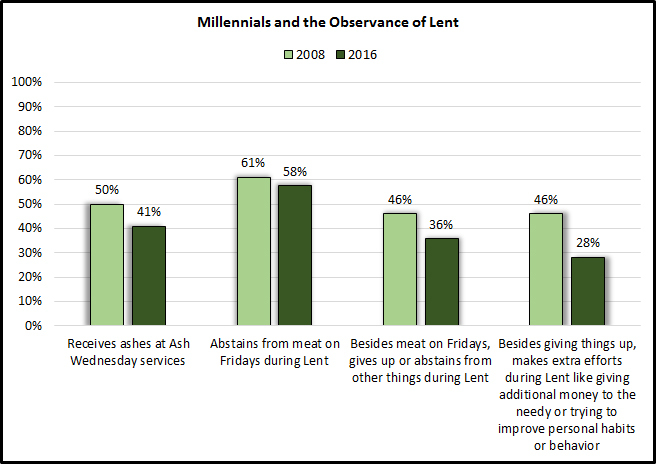 Although there is not much change among Millennials in abstention from meat on Fridays during Lent, this group has become less likely to receive ashes on Ash Wednesday, to abstain from or give up other things beyond meat on Fridays, and to give additional money to the poor or try to do more to improve themselves. Note that the make-up of Millennials, the youngest adult generation, has changed over time as younger members of this cohort have entered adulthood since 2008. Although U.S. adult Catholics rarely go to confession, their frequency of doing this has neither been falling nor been rising for more than a decade. More than four in ten don’t go to confession with any regularity. Nearly three in ten goes at least once a year. Adult Catholics in 2016 are slightly less likely than those in 2008 to have attended a Catholic primary or secondary school as children. They are also slightly more likely to have attended a Catholic college or university. Only three in ten Millennials have attended a Catholic primary school compared to a majority of Vatican II Generation (born 1943 to 1960) Catholics (54%). At the same time, Millennials are more likely than any other generation to have attended a Catholic college or university (12%). This is in part due to a majority of Millennials having attended college and fewer than half of Vatican II and Pre-Vatican II Catholics reporting this. While many assume Millennials are more likely to be enrolled in parish-based religious education than older Catholics, this is not the case. Only 36% of Millennials say they were enrolled in parish-based religious education at some point compared to about half or more Catholics in older generations. The consequences of fewer young Catholics receiving a formal Catholic religious education are broad. We have noted these related to school enrollments and will soon be highlighting the impact of this on Catholics leaving the faith as well as on Catholics’ understanding of the relationship between faith and reason (...stay tuned). It should come as no surprise that Catholics have become more racially and ethnically diverse since 2008. Through generational replacement, immigration, and varying sub-group fertility rates the share of Catholic adults who self-identify as non-Hispanic white has declined (-6 percentage points and the percentage self-identifying as Hispanic or Latino has grown (+6 percentage points). Fewer than half of Millennial Generation Catholics self-identifies their race and/or ethnicity as non-Hispanic white (49%). Results regarding marital status may stand out as running counter to some expectations given general cultural changes in the United States. 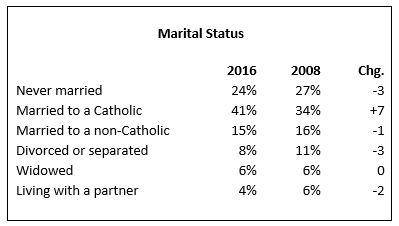 A growing number of adult Catholics report that they are married and have a Catholic spouse (41% in 2016 compared to 34% in 2008). This growth is a result of fewer reporting they have never married, are living with a partner, or are separated or divorced. As CARA has long reported, the population center of the Catholic Church in the United States is shifting to the South and West and away from the Northeast and Midwest. More Catholics reside in the South than in any other single region of the United States. Finally, one can see the generational replacement occurring among adult Catholics by looking at the changing sizes of Catholic cohorts. In 2008, Pre-Vatican II Generation Catholics made up 17% of the adult population. Today, they are 6%. Millennials on the other hand have grown from15% of the population to 26%. The largest portion of the adult Catholic population is of the Post-Vatican II Generation, born 1961 to 1981 (38%). As Pre-Vatican II Catholics become a smaller and smaller share of the Catholic population in the future, the Church can expect to experience declines in Mass attendance and further growth in racial and ethnic diversity. Does Hillary Have A “Catholic Problem” Now?